I have a lot of favourite things! Enough to keep me going on these lists for a while. Here are some random favourites. FYI, I am Canadian, so YES this is the correct way to spell “Favourite”. If you disagree, the first entry is for you. Favourite Blog: This was the first blog I started reading regularly. Rachel Held Evans explores deep topics with enough humour to make it entertaining, and the eloquence to make you really think. 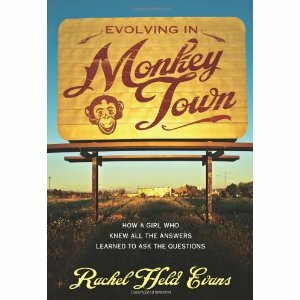 I also love her book Evolving in Monkey Town and not just because I’m a sucker for a clever title (Rachel grew up in Dayton, Ohio – site of the famous Scopes Monkey trial). If you are intelligent, open-minded and appreciate dry wit, you will love this blog. Favourite waste of time on YouTube: “Because two minutes in heaven is better than one minute in heaven.” Thanks to my pastor for sharing this classic with us. Not in church, mind you; that’s what staff parties are for. Warning – do not call your children to gather ’round to watch Business Time by Flight of the Conchords. It is for married people. I don’t mean that in the x-rated sense… exactly. Calm down mom. Never mind, you’ll see. Favourite iPhone App: When my nephew was born a few months ago all the girls gathered round the iPhone to sing him Happy Birthday. With the LaDiDa app you simply sing a song and it will add a beat and accompaniment to your voice. Then you wow the masses (a.k.a. the grandparents) via e-mail, Facebook or Twitter. They call it reverse karaoke. We prefer “rhythm synth pop” style, but “tasty breaks rap” is cool too. Only $2.99, but worth the hours of fun my girls have had playing around with it, especially since we discovered it will also create a video of you singing. Favourite movie about/for teenage boys: I have nothing against teenage girls. I was one. I plan to have 3 myself, buuut… the boys crack me up. It’s one of my favourite genres. In the grand tradition of Stand By Me and the Goonies, I thoroughly enjoyed stinky teenage boys punching and insulting each other while trying to save the world (and get the girl) in Super 8. Favourite post-apocalyptic book series: This is definitely my favourite “read for fun” book genre these days. There is something fascinating about society remade. About this time last year I started reading Hunger Games by Suzanne Collins. It is a dark and disturbing world where children are enlisted to fight to the death to both entertain and appease a corrupt ruling class. Not for the faint of heart, but very intriguing. Also, an honorable mention to The Uglies by Scott Westerfield about a tightly controlled world where everyone is forced to undergo drastic plastic surgery at age 16. So here’s me, wondering which post-apocalyptic world is more horrifying. This entry was posted on Thursday, January 5th, 2012 at 8:12 pm	and tagged with app recomendation, blog recommendation, book recommendation, favourites, iPhone, movie recommendation, quotes, videos and posted in favourites. You can follow any responses to this entry through the RSS 2.0 feed.